This wonderful fudgy cherry brownie recipe will put a smile on your face any day! It is featured in our Spring postcard and one special ingredient is the Stone Kitchen Sour Cherry Jam. Please stop by to pick up your jar for this tasty recipe! 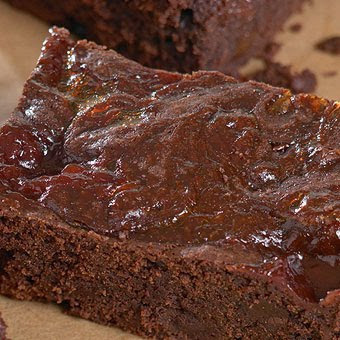 A moist and gooey brownie- sure to be a favorite! Preheat oven to 350 degrees F and grease a 9 inch by 13 inch pan. Melt butter and chocolate together in a medium saucepan. Whisk in sugar, brown sugar, eggs and vanilla, stirring two to three minutes. Fold in chocolate chunks. Stir in flour, baking powder, salt and Sour Cherry Jam. Pour batter into pan and bake for 40 to 50 minutes or until they just begin to pull away from the side of the pan. For ease of serving, let brownies cool completely before cutting.